According to a study conducted by Priorities USA, a political advocacy organization, around 200,000 votes were suppressed in the state of Wisconsin during the 2016 presidential election as a result of oppressive voter-ID laws championed by Republicans that took effect in 2016. The study, which was shared exclusively with The Nation, goes on to detail how the laws targeted African American and Democratic voters. Donald Trump lost the national popular vote to his Democratic challenger Hillary Clinton in the 2016 presidential election, with a razor-thin electoral college victory being secured by 77,000 votes in three states: Michigan, Pennsylvania, and yes…Wisconsin. 23,000 votes in Wisconsin specifically contributed to the 77,000 by which Mr. Trump secured a victory. “The study compared turnout in states that adopted strict voter-ID laws between 2012 and 2016, like Wisconsin, to states that did not. While states with no change to voter identification laws witnessed an average increased turnout of +1.3% from 2012 to 2016, Wisconsin’s turnout (where voter ID laws changed to strict) dropped by -3.3%. If turnout had instead increased by the national no-change average, we estimate that over 200,000 more voters would have voted in Wisconsin in 2016. This reduction in turnout particularly hurt Hillary Clinton’s campaign. The lost voters skewed more African-American and more Democrat. For example, Wisconsin’s 2016 electorate was 6.1% more Republican, and 5.7% less Democrat, than the group of ‘lost voters’. Furthermore, the WI electorate was 3.7% more White and 3.8% less African American than the group of ‘lost voters.’ This analysis suggests that the 200,000 lost voters would have both been more racially diverse and have voted more Democratic. Though Wisconsin saw the most dramatic reduction in turnout among voter-ID states, it was reflective of a worrisome broader national trend. In states where the voter identification laws did not change between ’12 and ’16, turnout was up +1.3%. In states where ID laws changed to non-strict (AL, NH, RI) turnout increased less, and was only up by +0.7%. In states where ID laws changed to strict (MS, VA, WI) turnout actually decreased by – 1.7%. The drop in turnout in these six states led to 400,000 fewer votes relative to turnout in states where ID laws did not change. In Mississippi, Virginia, and Wisconsin, strict voter-ID laws had an especially pronounced negative impact on African-American voters. 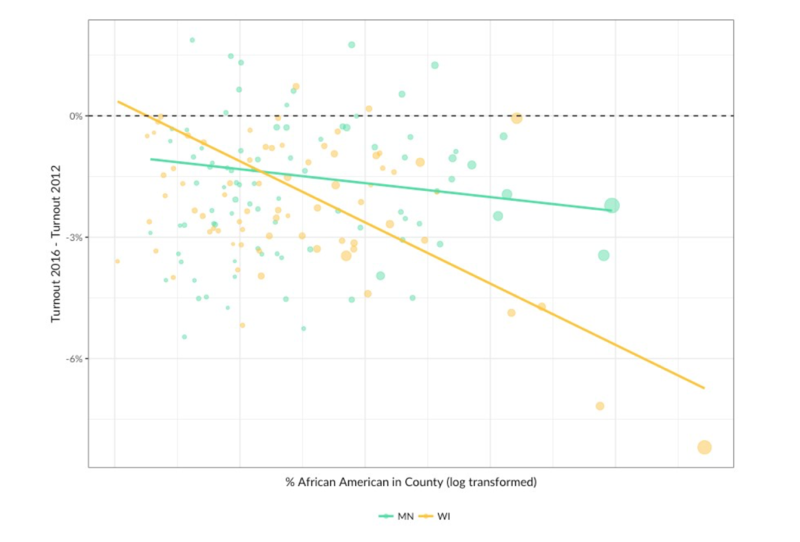 In counties where African Americans make up less than 10% of the population AND there were no changes to voter ID laws, 2016 turnout was up +1.9% from 2012, but in similar <10% African American counties where ID laws changed to be strict, total turnout decreased by -0.7%. In counties where African Americans make up more than 40% of the population, however, 2016 turnout was down -2.2% from 2012 in states where ID laws did not change, but down -5 points in states where ID laws changed to be strict. It’s important to note that this study was conducted by a Democratic Party–affiliated group and has not been peer-reviewed or gone through the typical academic vetting process. While some studies have shown big reductions in turnout among minority voters because of voter-ID laws, others have not. But the Priorities USA study is consistent with a 2014 study by the Government Accountability Office, which found that strict voter-ID laws in Kansas and Tennessee reduced turnout by 2 percent, enough to swing a close election, with the largest drop-off among newly registered voters, young voters, and voters of color. This study provides more evidence for the claim that voter-ID laws are designed not to stop voter impersonation fraud, which is virtually nonexistent, but to make it harder for certain communities to vote. This matters greatly today, because 87 bills to restrict access to the ballot have been introduced in 29 states this year, including voter-ID laws in 19 states. Arkansas and Iowa have already passed strict voter-ID laws in 2017. “Americans’ fundamental right to vote is under attack by Republican governors and state legislatures around the country,” said Guy Cecil, Chairman of Priorities USA. “Under the false pretense of combating voter fraud, Republicans are passing laws that make it more difficult and time-consuming for average citizens to participate in the democratic process.